INOVERA Bioscience, Inc. is located near Philadelphia in Ambler, PA. Our mission is to develop products for the medical and nutritional needs of patients to the highest quality standards and deliver those products as cost effectively as possible. Our products must provide a patient benefit not available in any other single product. INOVERA’s unique, patented product Forvia® is the first and only daily multivitamin/mineral tablet formulated for people with malabsorption of nutrients due to Inflammatory Bowel Disease (IBD), celiac disease or surgeries that may interfere with nutritional absorption such as weight-loss surgeries. The Chewable tablet formulation adds convenience and an option where difficulty swallowing, rapid transit of intestinal contents due to ostomy or other surgeries, such as gastric bypass, may be problems. Forbones® Xtra D calcium supplement tablets with vitamin D provide calcium as dicalcium phosphate, a non-gassy form of calcium that additionally provides phosphorous, the other major mineral in bone. Get information on bone health, calcium and vitamin D.
All INOVERA products are developed on the basis of sound medical information in consultation with clinical experts in the field. Our products use the finest quality raw materials and are manufactured and packaged in modern facilities. All products are laboratory-tested to assure potency and stability. Contact us for more information about INOVERA. 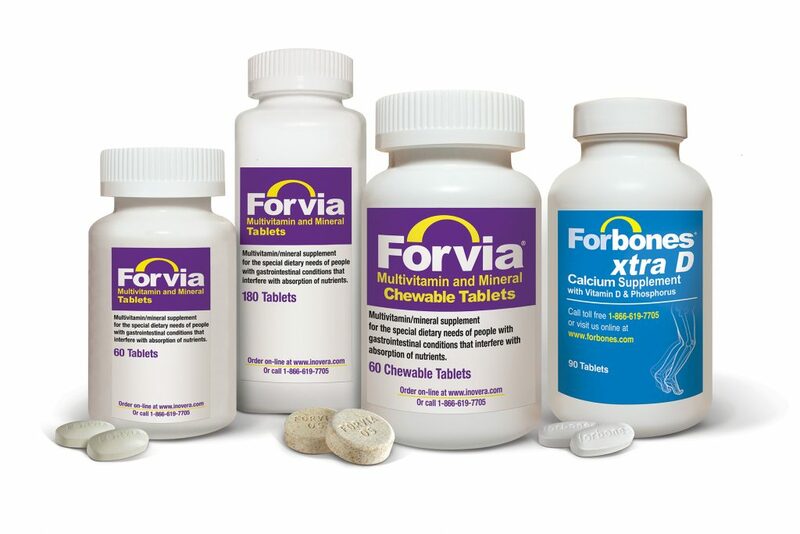 To order Forvia, click here. To order Forbones, click here.